Each year, travelers descend upon Cancun with one goal in mind — taking the vacation of a lifetime. And why not? With beautiful turquoise water, soft white sand and bright sunshine, Cancun is as close to idyllic as it comes. *Sample Pricing: This offer is available from hundreds of origin cities, but this price, which reflects the offer, is based on travel between Atlanta and Cancun, staying at the Grand Oasis Sens. Price is per person, based on double occupancy and select Monday departures and Saturday returns, May 13 – 18, 2019, and is subject to change. Additional restrictions and baggage charges may apply. See Terms and Conditions for details. 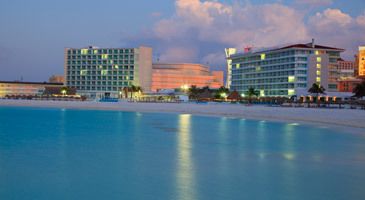 This beautiful, beachfront hotel overlooks the Caribbean, close to the tip of Cancun's isthmus, in the heart of the action. Some of Cancun's most popular dining and entertainment are on site. Guests can enjoy a variety of restaurants, activities and a dynamic kids club. These all-inclusive beachfront resorts offer the most complete experiences in Cancun. Discover award-winning restaurants, world-class live entertainment, a 43,000 square foot supervised kids club, expansive swimming pools and luxurious organic spa treatments. *Price is per person, based on double occupancy at the Grand Oasis Sens, between Atlanta and Cancun. Monday departures and Saturday returns via nonstop service on Delta and certain Delta codeshare partners, and is valid for specific travel dates May 13 – 18, 2019. Advance purchase requirements vary. Other travel days and dates and accommodations are available at other prices. May require travel on specific flights or times; blackout dates may apply. Purchase any Delta Vacations flight and hotel package from any Delta Vacations origin in the U.S. or Canada to Cancun, April 1 – 30, 2019, for travel April 1 – December 20, 2019. 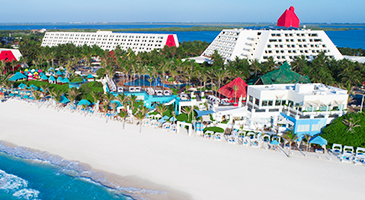 Participating hotels include: Mexico: Cancun — Grand Oasis Palm, Grand Oasis Sens, Krystal Cancun, Oasis Cancun Lite and The Pyramid at Grand Oasis. To receive the highest discount, travel July 1 – August 18, 2019. One kid, 12 years old and younger, stays and eats free when sharing a room with two paying adults, utilizing existing bedding. Cribs and roll away beds by requests are subject to availability. Book anytime, for travel April 28 – July 5 or August 18 - December 19, 2019. Book a Grand Ocean room for the price of a Grand room. Up to two kids, ages 3-12 years old, stay and eat free when sharing accommodations with two paying adults, utilizing existing bedding. Infants, 2 years old and younger, stay free at all times. Cribs and roll away beds by request are subject to availability. Book anytime, for travel April 28 – July 5 or August 18 – December 19, 2019.